Sonos has returned serve in the battle for smart speaker supremacy with a tempting bundle deal on its Sonos One. The Siri-powered Apple HomePod is priced at US$349 for a single unit and is targeted at the high-end of the smart speaker market with its emphasis on producing high-quality sound. Normally priced at US$199 for a single Sonos One speaker, the limited-time offer adds a second Sonos One for the same price as a single HomePod. The Sonos One deal could well give Apple users pause. Sonos is well-known for making high-quality speakers. Not only is the Sonos One compatible with Apple Music, it also offers support for Spotify, Amazon Music, TuneIn and many other streaming music services. 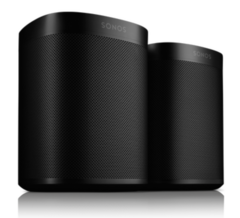 As a tandem, the Sonos One speakers can offer stereo sound in one room, or offer mono-sound in two separate rooms. The Sonos One is powered by Amazon’s Alexa AI assistant, which is more than competitive with Apple’s Siri. Users can ask for weather updates, news briefings, sports scores, set timers among a wide range of voice-controlled possibilities, including ordering products from Amazon directly. Each Sonos One can also connect to other Sonos speakers like the Playbar or the Playbase, giving them ability to deliver home theater surround sound – something that the Apple HomePod cannot do.